Gold Bond is a printable coupon from SmartSource.ca. Visit SmartSource, select the coupon, and click on ‘Print Now’. You can print your coupon twice. Visit any major retailer to use your printed coupon. I’ve used printed coupon at Walmart, Loblaws, Metro, and Shoppers and had no problems. 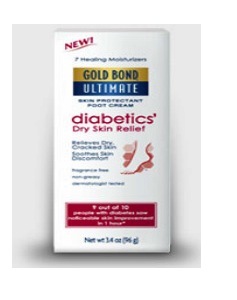 This is a Gold Bond Coupon to Save $3 on Gold Bond® Ultimate Derm Intense Dry Skin Relief Foot Cream 96g. Gold Bond Coupon is valid only in Canada. You can find Gold Bond Ultimate Derm Intense Dry Skin Relief Foot Cream in any drugstore such as Shoppers and Rexall. Just because you’re living with diabetes doesn’t mean your feet should suffer. Our Skin Protectant Foot Cream’s two active ingredients help soothe and protect skin while sealing in moisture. This rich foot cream formula is non-irritating, hypoallergenic, fragrance free, dye free and perfect for daily use. Dermatologist tested among people living with diabetes, it is proven to provide dry skin relief. Diabetics’ Dry Skin Relief Foot Cream — This stuff really works! Dry, Cracked and Calloused Feet and Heels.